Since the start of The Salvation Army’s international campaign, The Whole World Mobilizing, the Eastern Territory has been intentionally looking for ways to incorporate the objectives of the campaign into the milestone events that take place throughout the year. A joyful Go Team poses for a picture before hitting the streets of White Plains, NY. 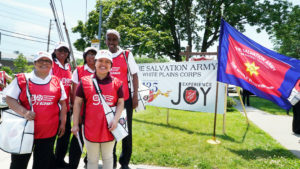 The decision to partner with the soldiers and members of The Salvation Army in White Plains was an easy one given their support in making this event happen. Though supported by the territory it was a grass-roots led movement with local Salvationists, stepping up and taking responsibility. The invitation was also extended to soldiers and officers from throughout the territory to take part and many did. The diversity of those assembled to go out and do mission, happily reflected the diversity of the city of White Plains. The theme, “Experience Joy” (based on Nehemiah 8:10) was chosen as this was an opportunity to share the joy of the Lord in the White Pains community through acts of kindness, simple words of testimony, and offers of prayer. 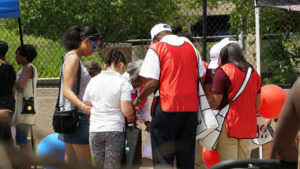 After gathering together in the corps for a time of worship, prayer, and practical instruction, 100 Salvationists hit the streets of White Plains. The Go Team shares a prayer with some local residents at the city’s Juneteenth Festival. 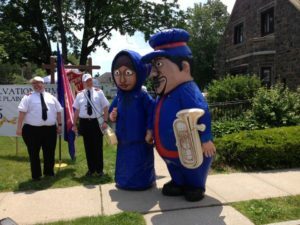 Fun inflatable Salvation Army characters were on hand to welcome neighborhood children. Though each Go Team was equipped with an ample supply of Gospel tracts, Bibles, as well as ‘How to Experience New Life in Christ’ bookmarks, and ‘Experience Joy’ branded give-aways, the preferred method of contact was one-on-one engagement. Indeed, many of our Go Team members experienced joy themselves as they shared the Gospel of Jesus Christ with people for the first time through uplifting, personal conversations. The day’s activities were also live-streamed on social media extending the event’s reach far beyond the community of White Plains. In the short span of just two hours, hundreds of people received prayer, heard a testimony, or were encouraged to seek out a relationship with Jesus Christ. Many people became even more aware of the work of The Salvation Army in their community, and two people made a first-time commitment to Jesus Christ. In all, the work of our Go Teams resulted in over 5000 Gospel encounters! And for that we give God the glory. If your corps, division, center, command or territory is looking to put on a similar evangelistic event in keeping with this year’s focus on The Whole World Mobilizing, feel free to download and use the Go Team logos and graphics. They can be placed on hats, t-shirts, and many other give-aways. Download these graphics here. We look forward to one day reaping the harvest of faith that was sown that day in White Plains, New York. No matter where in the world you find yourself, let us all take up the challenge given to us by our General to get out of corps buildings and into our communities. Let’s work together to bring the world’s people to the feet of Jesus Christ. 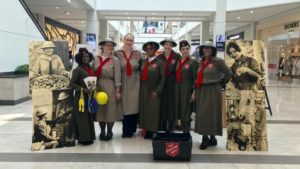 Marking the 100th anniversary of the ‘Doughnut Girls’ WWI ministry, Salvationist re-enactors shared with passersby the past and present work of The Salvation Army.